Previously, on MinerBumping... Highsec miner Fictions spiraled out of control after being bountied by Agent Yucie Van Burean. When Fictions declared war against her corp, it backfired. Later, Fictions was suicide ganked, and Agent Karak Terrel offered to sell him a permit. Fictions vowed to execute an elaborate revenge plot. 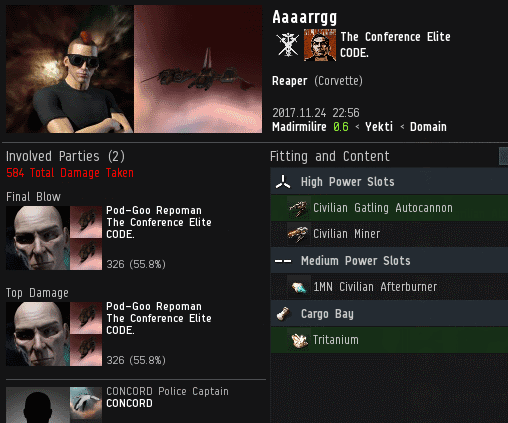 Agent Pod-Goo Repoman scored a sweet kill against Agent Aaaarrgg's rookie ship, which was being CONCORDed. The Anti-Gankers were doubtless green with envy. Fictions carefully vetted the bounty claim. Unfortunately, he chose to discriminate against Pod-Goo based solely on the Agent's affiliation with CODE. The miner was discouraged by the fact that only CODE. members were claiming the bounties. He had to make a more enticing offer. Meanwhile, things weren't looking good for Fictions' corp. He wardecced Agent Karak's corp, only to have the courageous Agent set the war to mutual. And the much-hated The Marmite Collective took a renewed interest in the carebear. Fictions put on a brave face. At least he was in a target-rich environment. 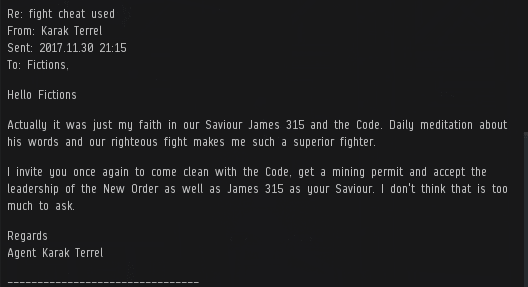 The miner found the EVE forums to be unexpectedly hostile. People were more interested in his history of making real-life death threats than in his offer to pay people to kill CODE. Fictions continued to defend himself against a rising tide of criticism. Where were all of the pro-carebear voices? Maybe they were still trying to post on the old forums. The miner was disgusted by the fact that no one seemed interested in killing CODE. members, even for pay. His master plan was a big flop. Time for Plan B. Plan B consisted of Fictions threatening to quit the game. If people thought he wasn't playing EVE anymore, maybe they'd leave him to mine and mission in peace. Although Fictions told everyone he was leaving, he couldn't resist the temptation to continue spreading his vile, bot-aspirant philosophy. Agent Karak, who still had a mutual war against Fictions' corp, went hunting--just in case the carebear was still active. Karak discovered Fictions hiding in a 1.0 security system. The carebear's capacitor-tanked Navy Raven was no match for the Code. Fictions spent the night replaying the battle in his mind over and over, trying to figure out what went wrong. Finally, Fictions had a revelation: The only reason he lost the battle was because Karak was being remote-repped by a cloaked ship! That was obviously against the rules, so Fictions filed a petition to report Karak for hacking. Our hero vigorously denied the accusations. Though Karak had indeed made use of an overpowered game mechanic, it was the Code, not a hack. The next day, CCP closed Fictions' frivolous petition. Outraged by the injustice, the miner decided it was time to go. Fictions and his alts dropped corp.
Fictions announced his retirement from EVE, a game he'd played since 2006. Highsec had changed a lot since the miner had started playing. Regardless of what Fictions said, there's still a chance that he might return to the game. Our Agents remain ever vigilant. Paying folks to shoot at in-game enemies? 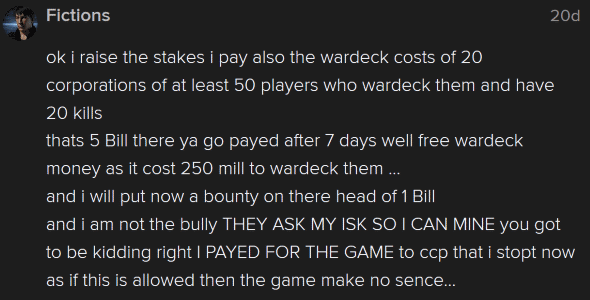 Sounds similar to Gevlon's Plan, except he funded Mordus Angels to the tune of many billions of ISK, and still failed. Why did Fictions think it would work if he instead invited randoms and offered to pay them a pittance? Yet another paying sub that Jamey and his CHODE. slaves have driven from the game. Interesting that you never hear Jamey spread his lies about CHODE. griefing actually increasing sub retention anymore. You have James to thank for the population of TQ being as high as it is! Were it not for the coming of James and his Code, the servers would probably be closed by now. Praise James 315 and the purifying fire of his catalysts. Never forget ag moderator shardani. wow just wow. a capacitor tanked battleship. that's about as bad as the failures antigankers fly. small reps? hahahahaha. Don't forget the single ecm drone. Hahahahaha. I lold reading this. Uh that was your code spy remember, no wonder he killed himself you idiots drove him nuts. Keep being angry about your failures. Remote reps while cloaked? And probably petitioned for it. I bet someone got a good chuckle out if that. Ok, there's no excuse for that much ignorance coming from one carebear. That miner needs some "re-education". 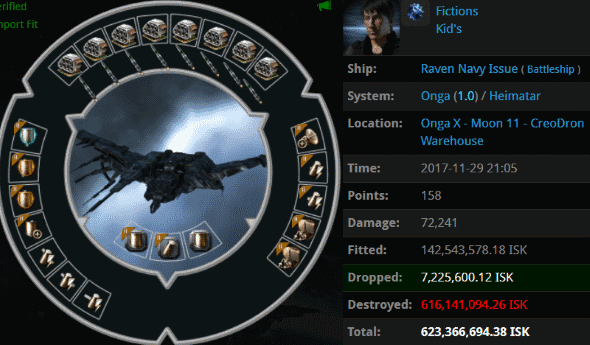 Some sperglords never really quit EVE, they are so bad that they forget how bad they are. Sadly, that idiot probably didn't quit at all. Oh real nice, now you support suicide, no wonder people hate you, all you guys do is tell people to kill themselves, no wonder your agent did it and offed his kid too. ahahahahah I just checked yesterday's comments section, looks like James nerfed the hell outa little johnnie pirtle. I'm laughing so hard thinking about him feverishly doing his copy/pasts thing for hours again yesterday, only to see all his filth just vanish at James' command. Lol my sides. Can you imagine how pissed he was? I wonder if his family is safe. Still funny as hell. 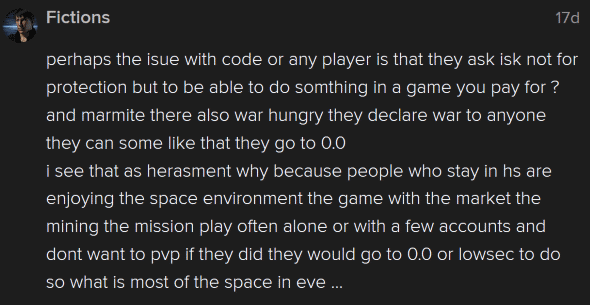 I love the extra content this blog brings to my EVE experience. Nerfed his own blog, sad. James tell us where the words touched you. Yes actually my family size is perfectly good, wife 2 kids 4 grandkids. All still good. Btw you do realize it doesn't take much to setup a copy paste program as well as get other people to do the same thing, I mean your constituents were more than happy to express their "approval" of their elected dictator. Stay tearful my friends, oh and stay sterile last thing we need is extra white supremacist Nazi's running around. Why don't you do like your friend and AN HERO yourselves so we don't have anymore of you racists and bigots around. He'll be back, unfortunately. 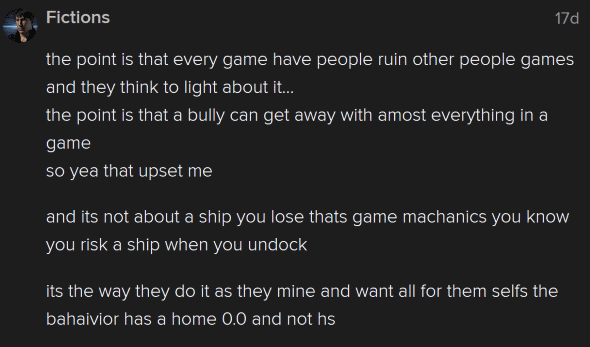 Pathetic filth like him never actually leave unless they get permabanned by CCP, which hardly ever happens. Don't be so hard on James, he trying to be the best Bin Laden he can be. Common salt is sodium chloride, NaCl. It can be made in a laboratory by the reaction of sodium with chlorine. However, it is found naturally in large amounts in sea water or in underground deposits. It is often obtained either by evaporating the salt filled tears of noobs to lose at online video games. Another nerfed blog you guys got rek'd damn all this winning is keeping you all very tearful. Did the spam guy hurt your wittle feelings? No wonder you agent killed himself. Fictions, you will not be missed. Get fucked son.